Explore the imperial city of the Hapsburgs, an architectural jewel on the Danube. Budapest's rich history and exciting street life are waiting to be discovered. Taste the spicy cuisine and spirited wines. Experience the exotic music and dance of the Magyars. Explore the markets, gardens, and cathedrals of this beautiful capital city. Sights to see: Castle Hill, Central Market, a Danube cruise, the Parliament Building, Vaci Utca, and more! Day trips: Just a few of the day trips we suggest from Budapest: the lovely Danube Bend where the artist town of Szentendre and the medieval fortress of Visegrad entice curious travelers. East of Budapest lies the Great Hungarian Plain, a vast grassland famous for its horses and legendary puszta outlaws. 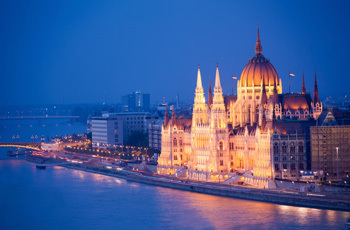 Sightseeing: In Budapest itself, you’ll want to explore the ancient castle, take in the exotic sights, sounds, and smells of the Central Market, admire the collections of Budapest’s many museums, and take in a concert or opera in one of the city’s renowned musical venues. Of course, the ancient churches and the Central Synagogue shed light on the diverse spiritual legacy of Hungary. The delightful Hungarian cuisine can be sampled in hundreds of restaurants and cafés. Don’t neglect a Danube cruise for a relaxing way to take in the city’s sights by river. Off-the-beaten-track treasures that can’t be beat: When you need to get off the beaten track, try a relaxing walk on the wooded Margaret Island, a refreshing day at one of the city’s historic spas, a wine tasting session at the House of Hungarian Wines, or even a walk through one of the fascinating caves in the Buda Hills.